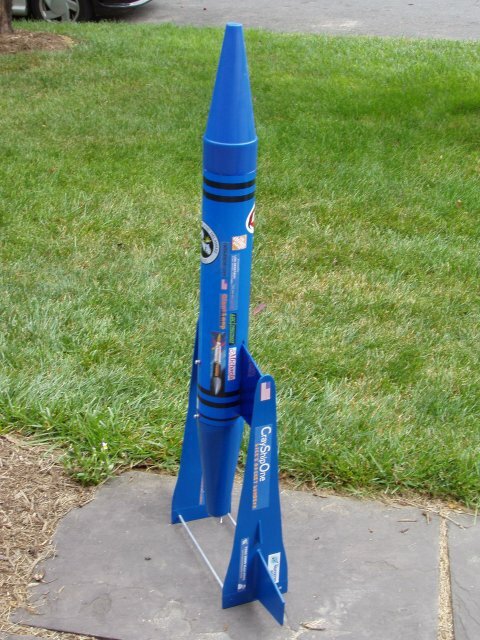 Essence's Model Rocketry Reviews is pleased to announce a special themed Photo Contest. 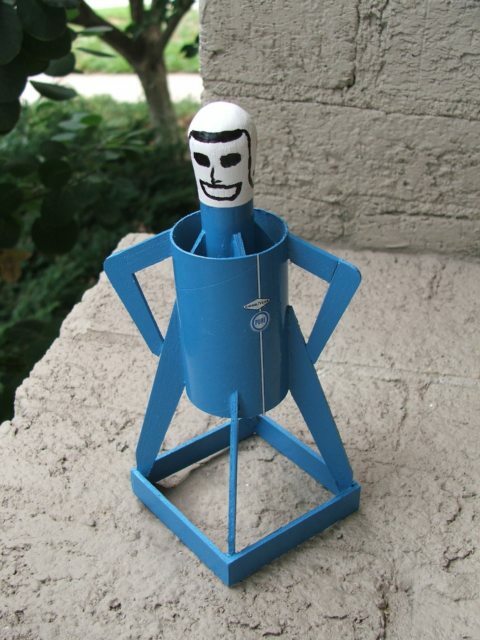 Rocketeers are people too, right? So there are other interests that hold our attention. Let's focus on NASCAR and Monster Trucks. Why? 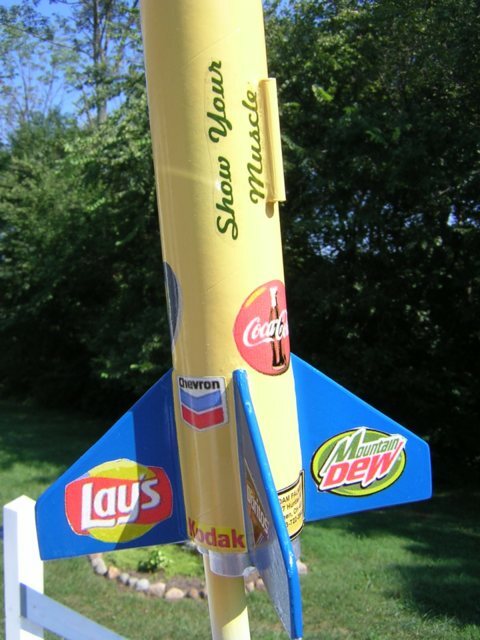 Because they have wonderful color schemes and flashy designs that can be converted to rocket paint schemes. Do you agree? Let's see them. 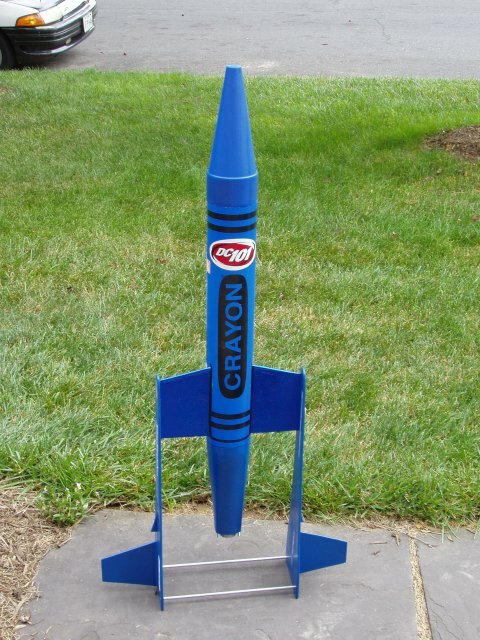 NASROC = Pick your rocket, pick your NASCAR scheme and put in on your rocket. 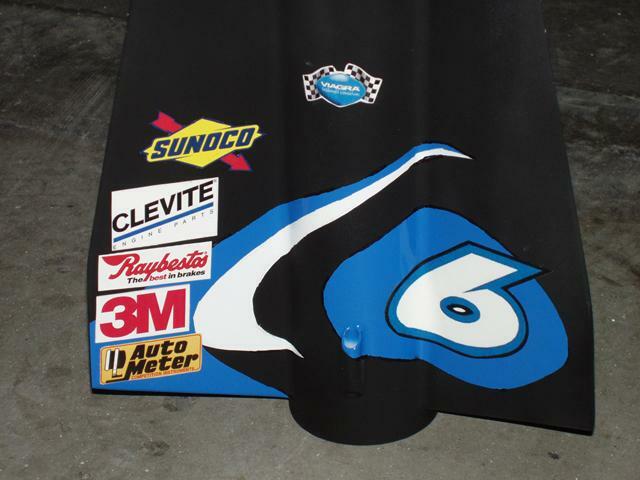 Or make up your own with the "sponsors" and number of your choice. Don't forget all the flash and glamor! MonsterROC = A Monster truck is a regular size truck with a big honkin' engine and other oversized features (e.g. wheels). The splash on all the colors, advertisements and names. 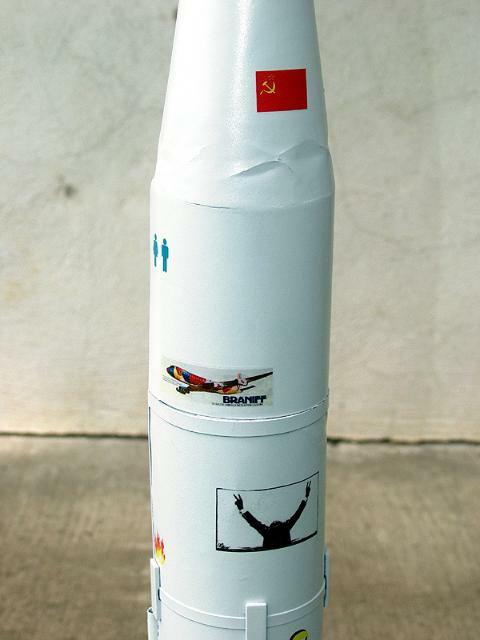 Do the same with your MonsterROC (for example, but use your own imagination: A Baby Bertha with a 38mm motor, 3x-sized fins, painted with "Big Baby" on the nose cone and covered with various mini advertisements for RailButtons.com, Rowes Retainers, etc., etc). Get the picture? 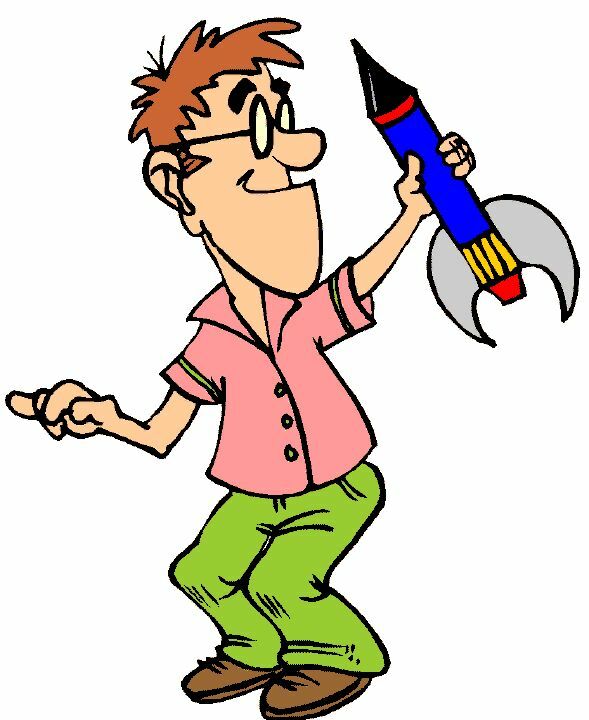 To help ensure a high level of participation, we will also allow a Sports Team rocket dressed up with your favorite major league sport colors, logos, mascot, name, etc. 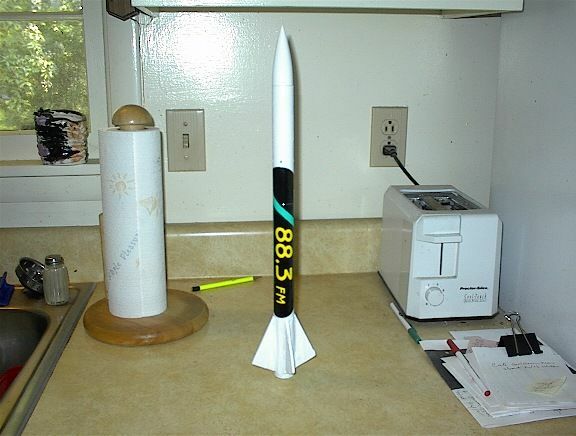 We know it can take some time to build and finish a special rocket, so we have allowed plenty of time during this contest. 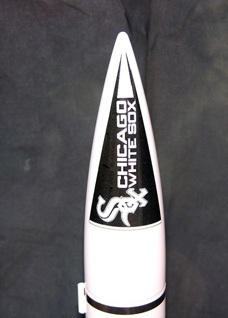 Winners will be judged by EMRR Guests during a voting week of August 22 - 28, 2005. Entry must be (3) to (5) photos showing some of the details, recommend a close up, launch photo is optional. Contestants may only enter (1) entry for NASROC and (1) entry for MonsterROC; or (1) entry with major sports team in place of either NASROC or MonsterROC. 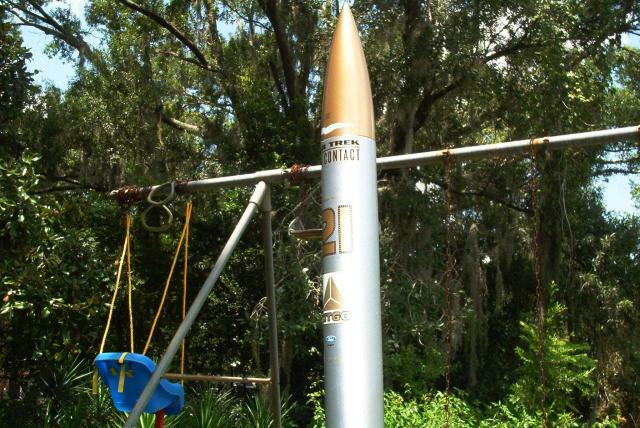 Contestants may not enter (2) major sports team rockets. 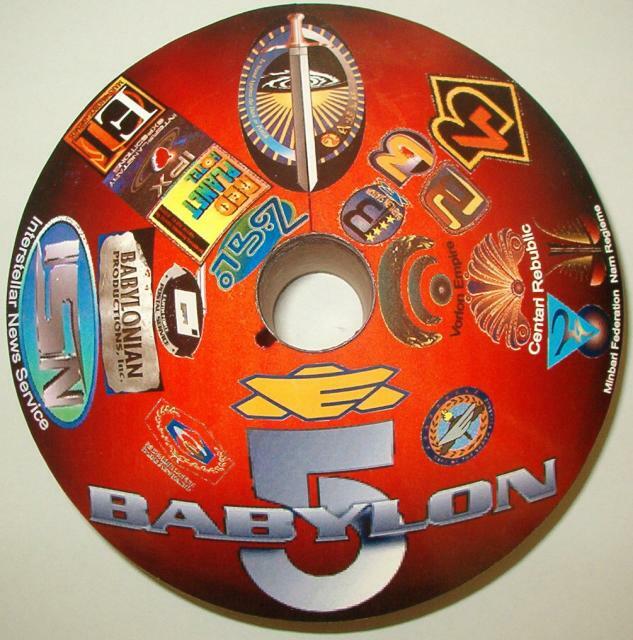 Contest is over on 8/29/2005. Online Voting will take place from 8/22- 8/28. YEEEEE HAW! CrayShipOne is 4" x 47" of AP-burnin', heads-up callin', crowd-pleasin' craziness. Weighing in at bit over 5 pounds, it is bound to make any RSO sweat bullets! A Loki H144 should boost this MonsterROC to around 1000 feet. 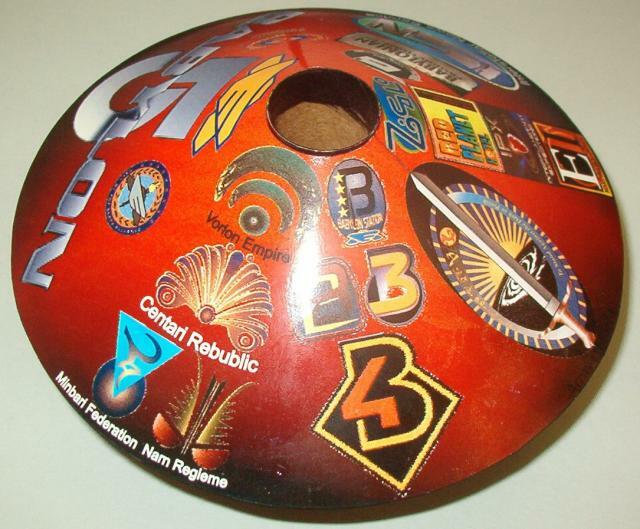 CrayShipOne sports logos from a D.C. rock station and MDRA, and has custom stickers for all its major "sponsors". 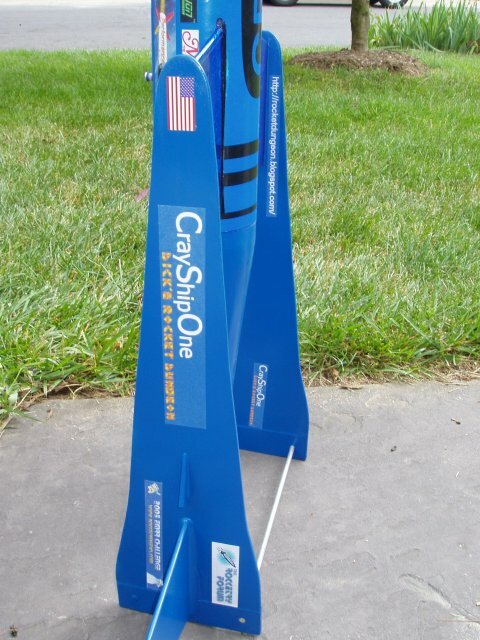 If you want to see your logo proudly displayed on the CrayShipOne, you had better hurry - there may not be a second chance! After it brings home the MonsterROC Prize, the builder hopes to market the design to a British (make that ANY) billionaire. 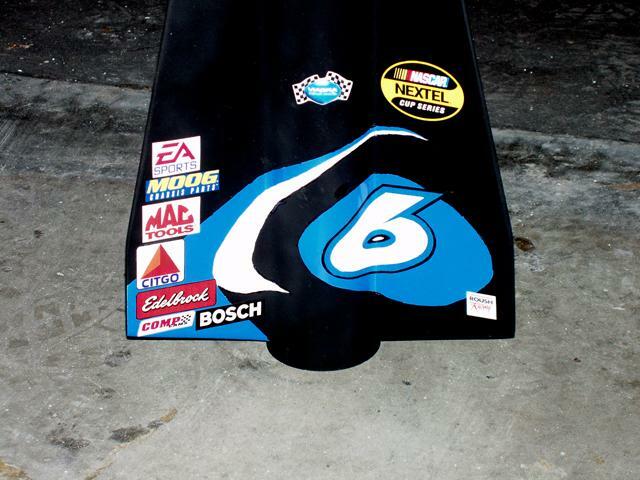 My entry is based on the design of Mark Martin's #6 Ford. 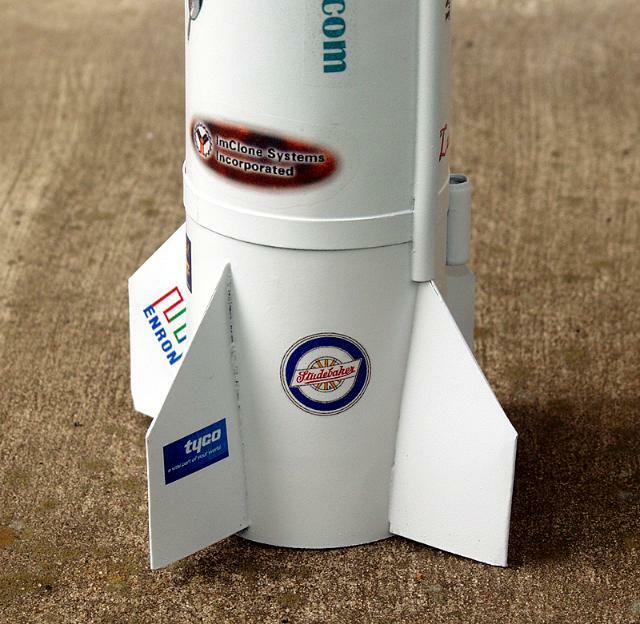 I though it was terribly funny to have a rocket sponsored by Pfiser/Viagra.... "If your rocket stays up for more than four hours, contact your physician immediately..." I did include a small Viagra Racing Team Logo, but chickened out about putting a full size logo on the rocket. I tried to create a design scheme that recreated his color scheme and sponsor logos and feel that I was fairly successful. 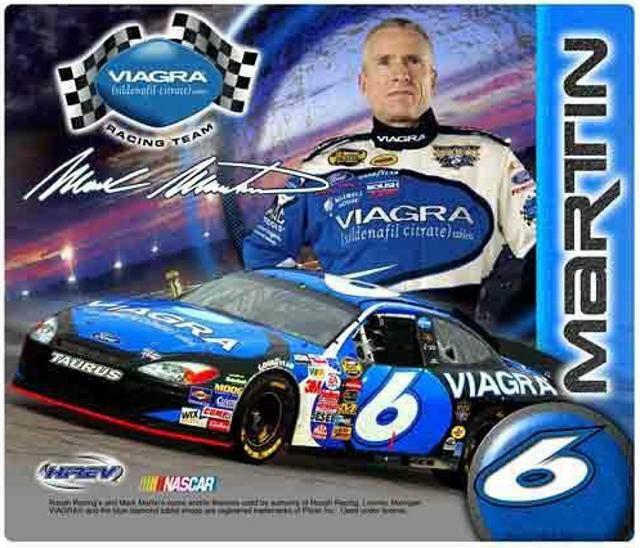 I have included artwork of Mark Martin with his vehicle to show my inspiration. I enjoyed the challenge of this contest, but shouldn't have waited to the last minute to rush through the execution of the plan that I had made waaaay back when the contest was announced. Thanks for running it (as always)! 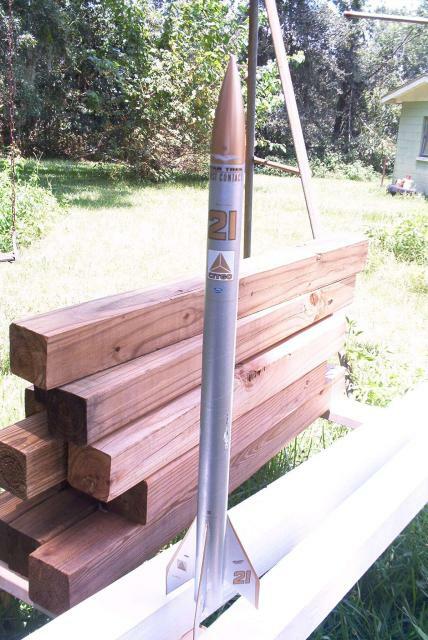 My entry started out as an Estes bull pup 12d. 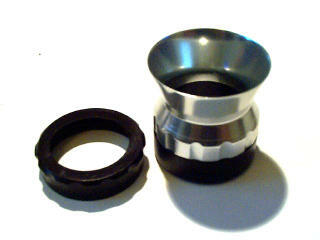 The engine mount is modified to take 4 13mm engines. 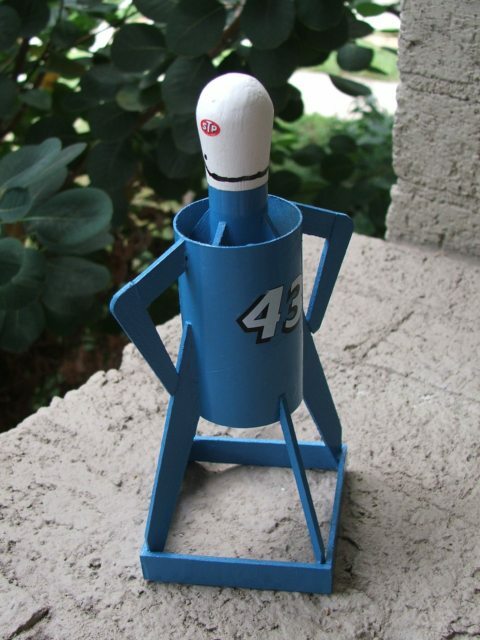 I call it Show Your Muscles because like a NASCAR, this rocket has a lot of power hidden under the hood". 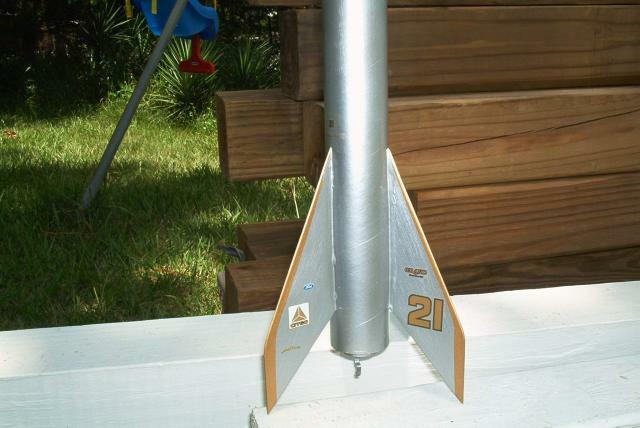 Paint is yellow, blue and metallic blue for the nosecone. 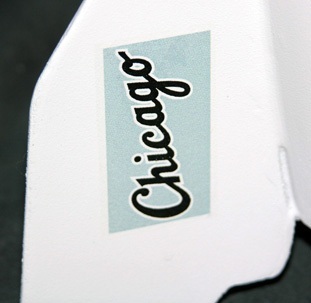 The decals are inkjet printed on clear and white backed decal paper. 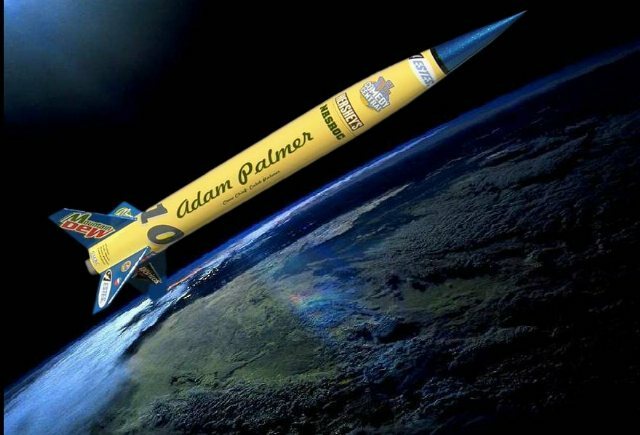 Then the whole rocket was coated with Future floor polish. 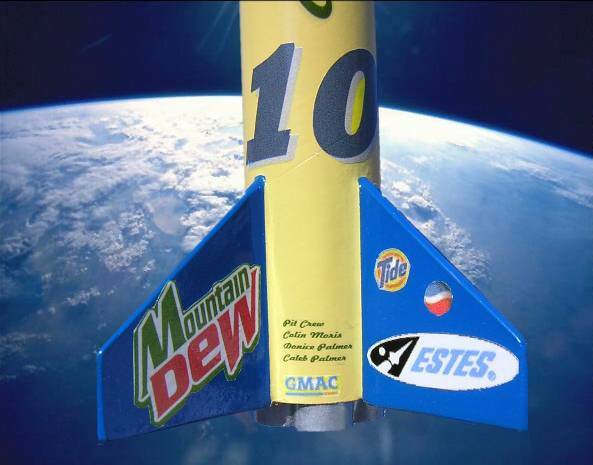 The major sponsor is Mountain Dew. I also tried my hand at photoshopping the rocket into different backgrounds. I just got this finished!! Here is my entry for the contest. 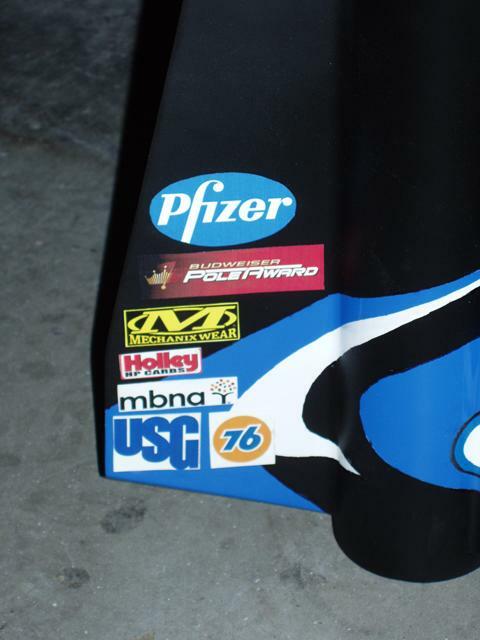 It is the Top Fuel dragster rocket of Tony Schumacher. I call it "NHRA-Launching into the future". 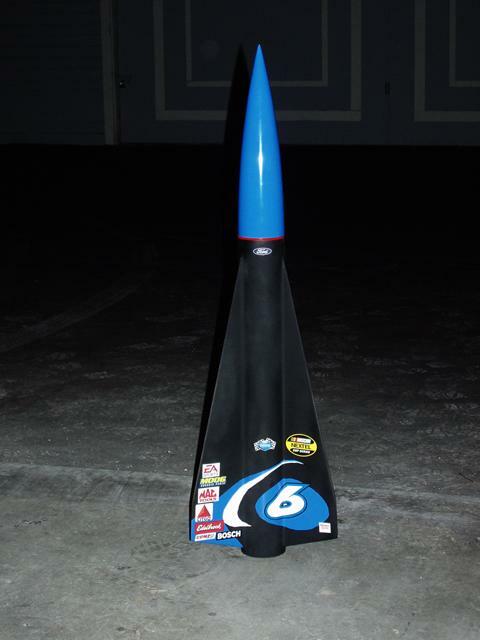 It is a 24" BT-60 tube and a PNC nose cone from a Screamin Mimi. 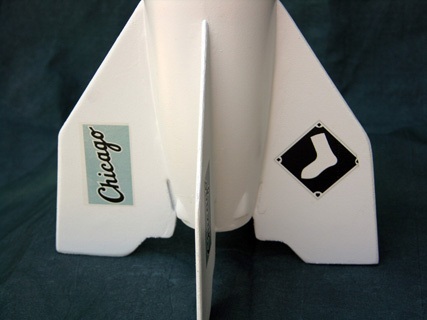 The vertical fin is clear styrene with the fuel wing struts painted on in black. 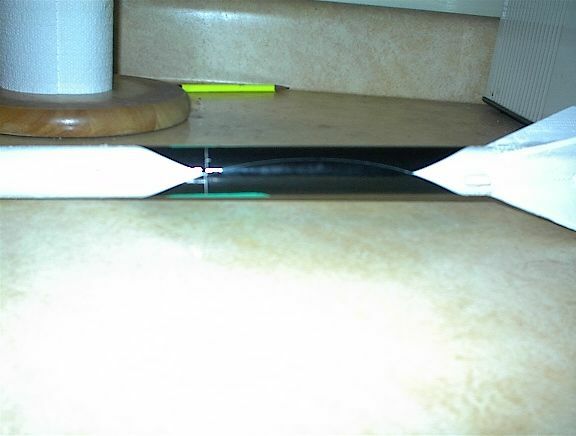 I wanted a see through fin to more closely resemble the actual struts and upper fins on the dragster. 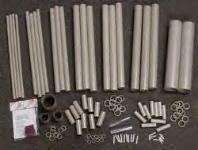 It is a duel rear chute arrangement (BT-20 tubes), just like the dragster would have, with two 13mm engine tubes for power. Rocksim gives it a 130' or so height. The total weigh came in at 3.2 oz. which the A10-3t mini engines should get off the pad according to the sim. 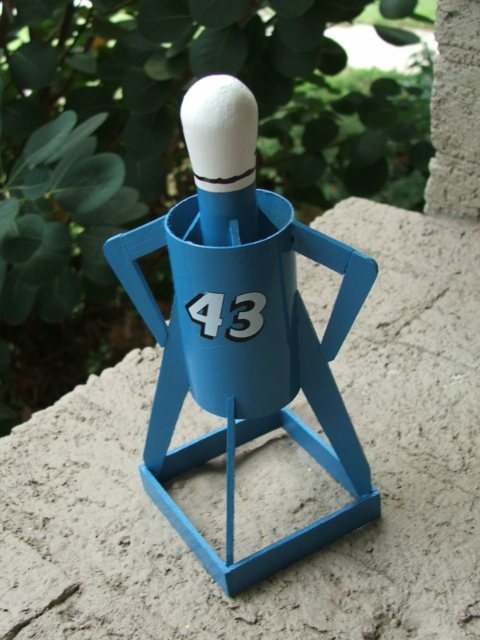 In homage to the King, Richard Petty, behold the Astron Raceman. 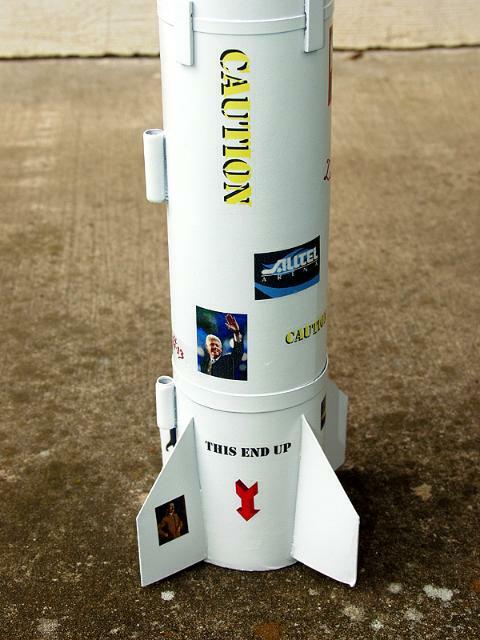 I had planned to do a rocket with some sort of Petty theme, but my wife had the idea of doing a rocket based on Richard himself. 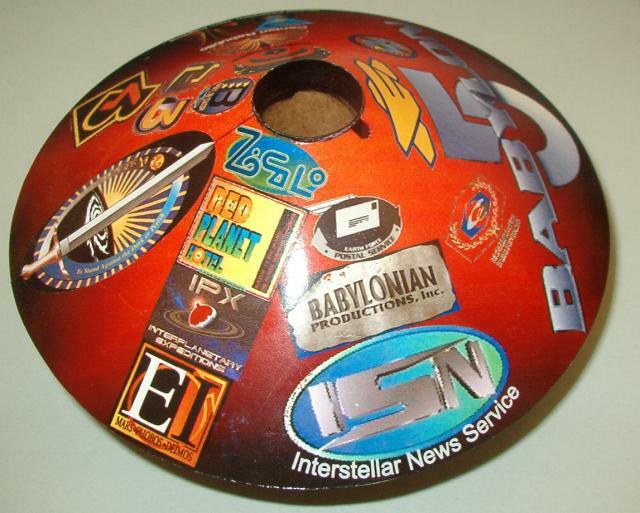 I'd bought an Astron Spaceman nosecone from BMS a few years earlier, so it was just a matter of finding it and raiding my stock car modeling decal scraps. I was going to do some more work on the face, but what you see taxed my almost non-existent artistic skills enough. The helmet, toothy grin, and shades will have to do. Hopefully the King has a sense of humor. This is my MonsteRoc entry. It dosn't have any decals on it in the pictures, but it does right now. 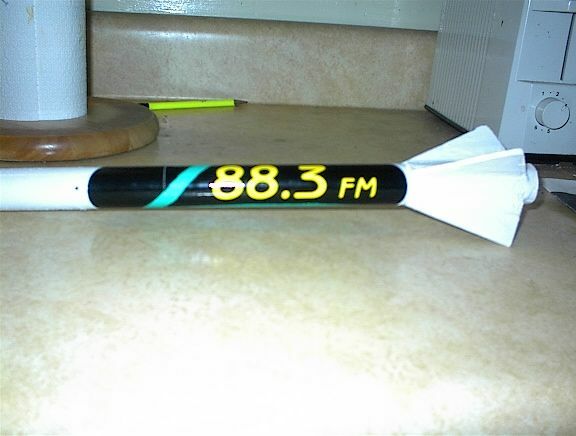 It has a Z88.3 FM Christian radio sticker on it. 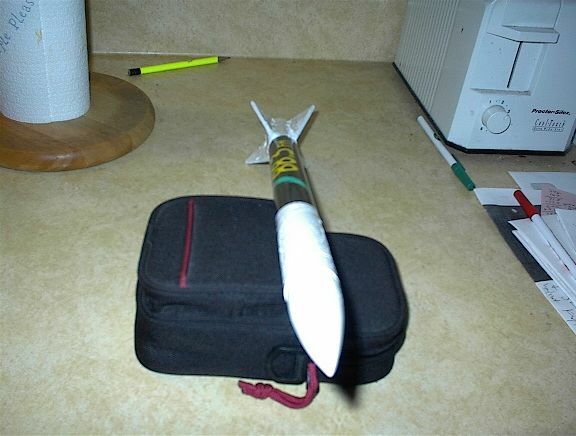 It is a minimum diameter 24mm rocket that will fly with an Ellis Mountain G37. This motor should sent it to about 7,000 feet at the beggining of next year. 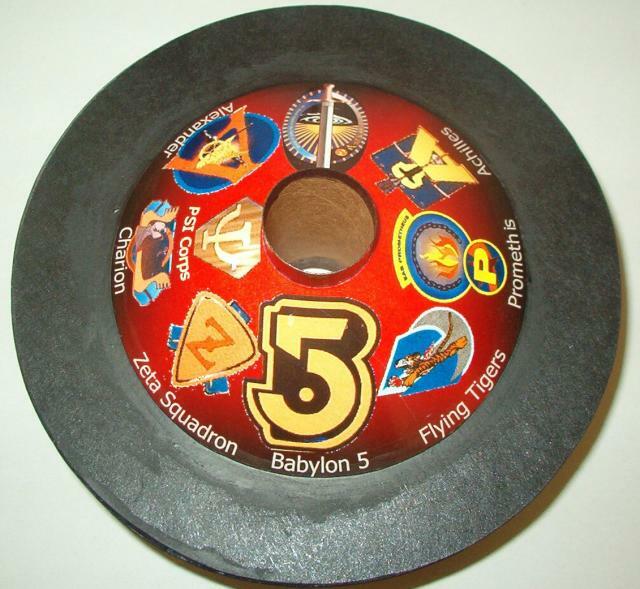 One more thing, it carries a PerfectFlite Alt-15k recording altimeter. I'm going for the 'G' altitude record. Caution! Beware! Run like hell! 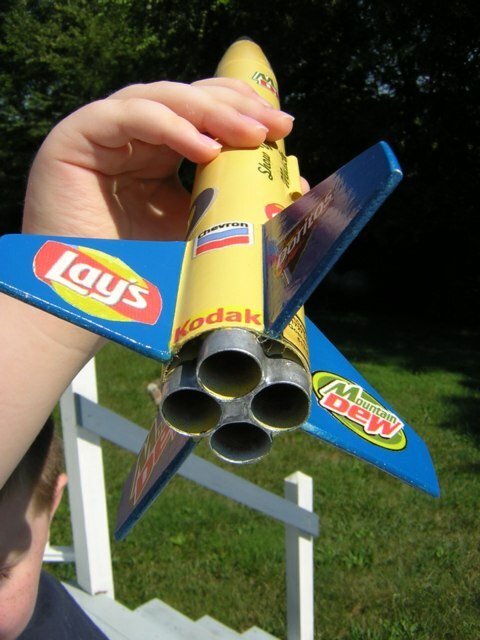 Behold the wonder of Rocket Ship Lucky #13. She is sponsored by Americas captains of industry, our greatest leaders as well as movers and shakers from around the globe. 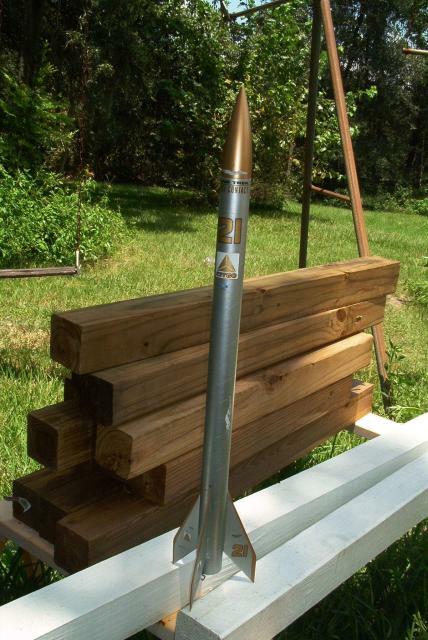 At twenty-eight inches long and just under 14 ounces her 29mm motor mount will send her screaming from the launch pad in to the sky, into the ground, into the crowd or into heavily populated areas near by. Fire, destruction, death and mayhem are all just part of a days work for her. When it is time for Lucky #13 to fly, you can run but you cant hide. 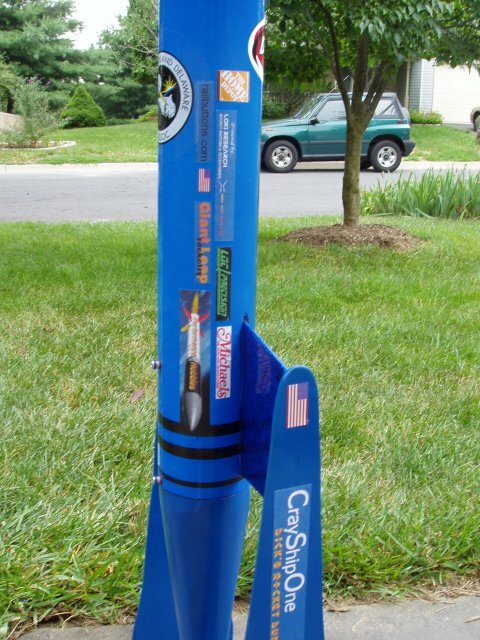 Originally an Estes StormCaster. 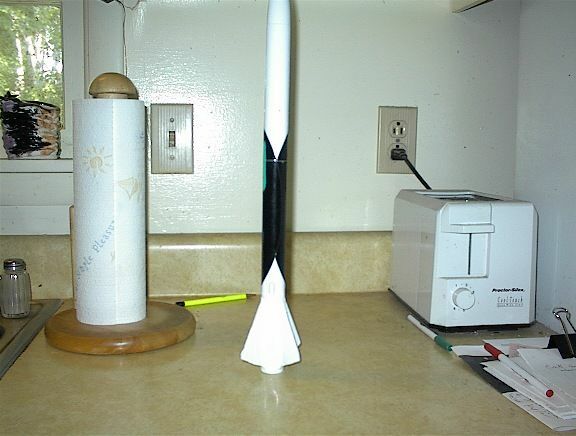 Slightly modified, replaced the balsa fin stock with basswood, and installed an "E" engine mount. Kevlar shock cord anchored to the engine mount. 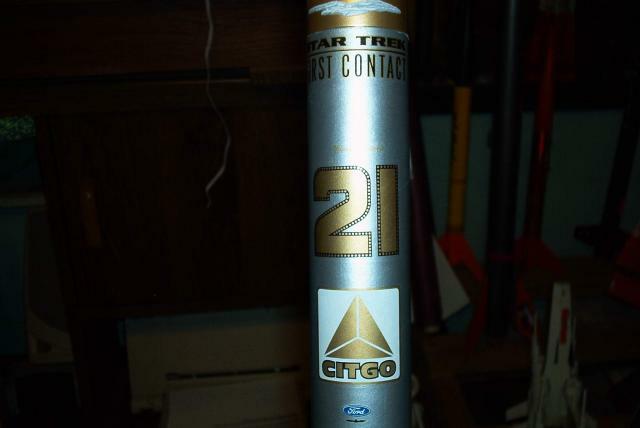 Painted and marked as the 1996 T-bird driven by Michael Waltrip in the final race at Atlanta to honor Star Trek. 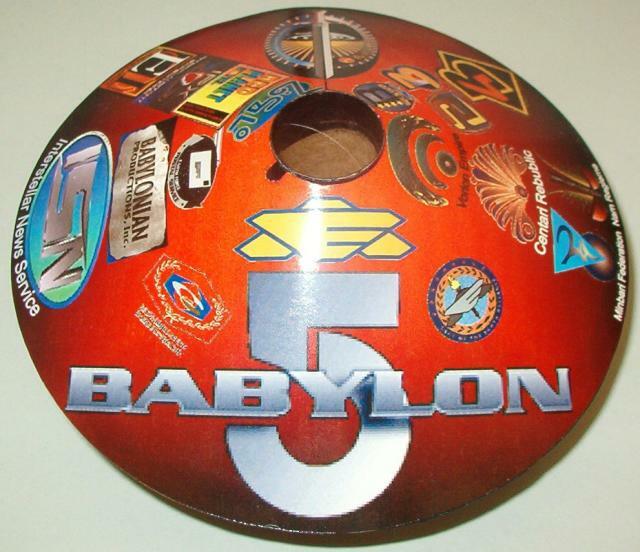 Markings are water slide decals for a 1/24th scale car.